Lead your loyal pilgrims to safety in a cunning combination of 2D action puzzling and fully-immerive VR. 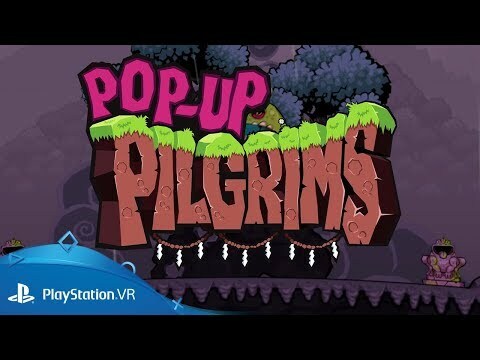 Put on your Playstation VR headset and discover a world of pop-up islands, colourful characters, and deadly demons, all uniquely presented as 2D graphics in a wrap-around 3D space. More than 50 stages curve around the player as they try to lead the pilgrims from platform to platform – left, right, in or out – to take on a cast of lively enemies and find a safe route to the exit. Guide a group of pilgrims over a series of vibrant pop-up islands on a quest to reclaim their beloved deity’s stolen source of power. Navigate layered, 2D platforms presented in a unique pop-up style made possible by PlayStation VR. Command multiple pilgrims seamlessly and intuitively. Split the team up to manipulate the stage and collect items, or bunch together to defeat tougher enemies. Defeat six demonic bosses, from the enormous hungry toad to the rattling bones of the demon lord. A second non-VR player can enjoy a different view of the action on the TV and can even control a special character to help collect items. An outstandingly catchy and original soundtrack matches the cheerily animated antics. Looking for great VR experiences?